Salvage operations are in the works as the search is suspended for the missing crew. A large car carrier with a capacity of 5,200 vehicles was abandoned at sea after the ship’s crew decided to escape a fire that broke out in the early morning of December 31, 2018. The ship, called the Sincerity Ace, is a Panamanian flagged vessel, and was headed to Hawaii and United States ports with about 3,500 Nissan cars, and is now adrift in the Pacific Ocean, about 2,900 kilometers northwest of Hawaii. Sixteen crew members were rescued by passing merchant ships responding to distress calls, but, unfortunately, four remain unresponsive and are feared dead. According to the US Coast Guard’s latest update, they have suspended the search for the last remaining crew member, and have reported that the ship itself is still on fire and is leaning to the right side. The Sincerity Ace has been in service since 2009 and is owned by Shoei Kisen Kaisha and has been chartered out to Mitsui OSK Lines. A salvage plan is being formulated and commercial tugboats have been dispatched together with other salvage vessels, also in the hopes of recovering the rest of the missing crew. What we know so far is that the vessel was loaded with Nissans at Yokohama and Kanda, and was headed to Honolulu, then Mazaltan, Mexico, Puerto Rico, Florida, and Baltimore. The status of the cargo and vehicles is still unknown, and we’re pretty sure a few showrooms can expect delays in shipments for quite some time. 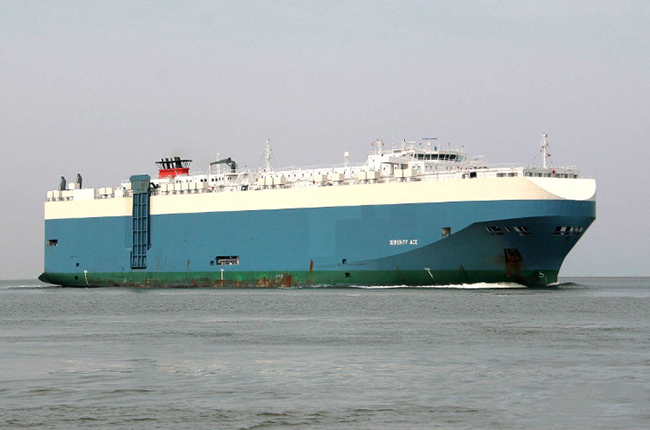 This isn’t the first time a car carrier from Mitsui OSK Lines has ran into trouble, as in 2006, the Cougar Ace, lost stability and listed heavily on a voyage from Japan to North American West Coast ports. The entire cargo of 4,700 Mazda vehicles had to be scrapped, and the vessel itself was salvaged and repaired for service. Our thoughts and prayers are with those affected, and we sincerely hope that those who are missing can be found and that the cargo can be returned to shore very soon.